"Flexible Digital Signage by Embed"
Embed's digital signage platform and content make managing a scheduling content easier than most platforms. The flexibility it offers streamlines the system to make it user-friendly. The free trial that they offered was nice as well. Some features seem to be lacking in comparison to others. While you can do a lot of things with this solution, the flexibility of those features sometimes became difficult and a bit restrictive. Try the free trial to make sure it meets your needs. The fact you can have multiple users is a great feature, as well as the cloud based system that let's you load content and access it from anywhere is a big bonus. The touch point feature is very nice in terms of way finding, menus, and maps which allows guests to interact with the screens and reduces the need for assistants, ushers, etc. The dynamic media options that are available are features we looked at implementing as well but just didn't need to yet, but may in the future. "Embed Signage, Essential for Digital Signage"
Embed Signage is easy to use but extremely powerful with the functionality of much more complex systems. Incredibly Scalable from 1 Screen in 1 location to Multiple Screens in Numerous locations controlled from one login. It is Versatile can be used for Corporate Information systems, Retail, Fast Food, Hotels, Restaurant and Public Information Displays. This all comes with a small price tag and excellent backup from a very obliging, helpful, competent and friendly staff. There is very little to dislike but I think it would be good if there were some image manipulation tools included. I am happy to recommend Embed to all my customers, I have looked at other software/solution but I find Embed to be the best all round solution. Helping my Customers to increase sales through Menu Boards and giving them ability and versatility to change their offerings easily and quickly. I have been able to offer a complete solution to my customers when using Embed Signage with Samsung Smart Display as well a number of other platforms. What Digital Signage solution do you use? "My favorite platform from my favorite group! " Embed signage is so easy to use and implement from the get go. It can be as simple or as robust as you want it to be, its all up to your own creativity which I love. It also helps that they have an amazing team of professionals who are always striving to be the best and open to feedback. Poke around, watch some tutorials, try it out! You'll realize quickly how great it is. If your lucky enough to talk with their team, you'll know they're working hard to continue to build new great features. Our clients ask for many different options of control, response, presentation, etc. The beauty is that the simplicity allows our clients to have a finger on the pulse of all of their signage in any location. They can be as hands-on (or off) as they want. "A Robust Signage Software "
Embedsignage is in a constant state of growing. When I first discovered embedsignage over a year ago they had all of the tools I needed at the time but were extremely receptive and reactive to my feedback. The platform as a whole competes with many more expensive digital signage platforms for a fraction of the price. This is a company I highly recommend working with. I am very happy with embedsignage. The features that they presently lack, such as advanced reporting capabilities, they are actively implementing. If you are new to digital signage or a seasoned professional, you should not overlook embedsignage. A 30 day trial is free along with a host of support videos and tutorials. I am confident you will find it will suit your needs. As a design agency, Embedsignage allows us to implement complex design concepts into real-world, easily maintainable on-screen presentations. Our clients can update their content from anywhere and the software always meets their challenges with elegant solutions. We never have to worry about the hardware. 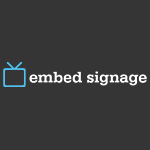 Mac, PC, iOS, Samsung, WebOS, Brightsign... Embedsignage supports them all. Thank you for your gracious review Christopher... we strive to better our software each and every day! Embed Signage gives us full control over screens and devices with a lot of features that are easy to use. The layout designer is incredible and has a lot of smart tools for creative and smart designs. Embed signage delivers a software that we can offer to our end-clients for a great price with top performance and stability. "Smooth Experience with the Best DS software!" Around 2 years ago, we had tested more than 20 well-known digital signage software from all over the world, and Embed Signage was the only one that could caught our eyes; because of its "flexibility" in design of any templates and also the powerful "plugins" they put into the software. In comparison with other DS software, I can not find anything I dislike in the software. Just try the trial version, you will see all the great features! It is a great help to illustrate any information beautifully into the public. Thank you Sadegh! It's amazing to hear we ticked all the boxes vs the other platforms you tested... we're really pleased you found us. "The right solution for our digital signage needs!" When our client asked us to help them implement a digital signage system as part of their internal communications, one of my colleagues immediately recommended embed signage. As tried the app, we noticed how easy and self-explanatory the admin's backend was, and while every section had a dedicated tutorial video, we really did not need to use those to get the system up and running. They support a wide variety of devices including Android and iOS based mobile devices, which made it easy for us to implement on our smart TV devices. I love the layouts section, but it lacks some image editing and color correcting features, I normally edit my photos on Canva then just upload them to the system, would prefer to do it all in one place. If you are looking to implement a digital signage platform in your company or on your campus, I highly recommend trying embed signage, the system is easy to use and you will be up and running in no time. We were covering a huge campus with more than 12 buildings, embed signage helped us implement our digital screens around campus with ease and show all announcements and news in a timely manner. "Embed Signage - Great platform - Great Support "
The platform is easy to use and even clients with moderate IT skills should find it easy to navigate and manage. There isn't really anything i dislike when we find an issue or have a question the embed team are quick to respond and help out in a friendly easy way. I have no hesitation in recommending it you won't be disappointed. I have used embed signage in a number of ways from info screens in a Library and Leisure centre to showing information to visitors at a Business centre. It makes clear communication easier and is dynamic so you can schedule content through a day or week and it looks professional. Hey Warren - great to hear you're loving the software. Thanks for taking the time to leave a review and share your experiences, it's always very flattering to hear. "Simplest yet rich CMS Solution available in the market"
I love the ease of use Embed Signage provides with its CMS Solution to all industries. Yet it is rich with templates and current Live information. There is nothing I dislike from Embed Signage. Great work all in all. Try Embed Signage and see the difference for yourself!! We assisted clients using our indoor and outdoor kiosks that had no available CMS Solution to use Embed Signage instead. Thanks for your review Mohamed, we're really pleased to read it. Learning curve. The forum is useful but it is building itself up so not all questions are solved. Still needs more community engagement. * We monitor all embed signage reviews to prevent fraudulent reviews and keep review quality high. We do not post reviews by company employees or direct competitors. Validated reviews require the user to submit a screenshot of the product containing their user ID, in order to verify a user is an actual user of the product. Hi there! Are you looking to implement a solution like embed signage?